In Defense of Democratic Socialism, Bernie Sanders Attacks “Casino Capitalism” | Democracy Now! AMY GOODMAN: And Anderson Cooper asked Bernie Sanders if a socialist could ever win a general election in the United States. This was Sanders’ response. SEN. BERNIE SANDERS: Well, we’re going to win, because, first, we’re going to explain what democratic socialism is. And what democratic socialism is about is saying that it is immoral and wrong that the top one-tenth of 1 percent in this country own almost 90 percent, almost—own almost as much wealth as the bottom 90 percent, that it is wrong today, in a rigged economy, that 57 percent of all new income is going to the top 1 percent. ANDERSON COOPER: You don’t consider yourself a capitalist, though? SEN. BERNIE SANDERS: Do I consider myself part of the casino capitalist process by which so few have so much and so many have so little, by which Wall Street’s greed and recklessness wrecked this economy? No, I don’t. I believe in a society where all people do well, not just a handful of billionaires. ANDERSON COOPER: Just so—let me—just to be clear: Is there anybody else on this stage who is not a capitalist? HILLARY CLINTON: Well, let me just follow up on that, Anderson, because when I think about capitalism, I think about all the small businesses that were started, because we have the opportunity and the freedom in our country for people to do that and to make a good living for themselves and their families. And I don’t think we should confuse what we have to do every so often in America, which is save capitalism from itself. AMY GOODMAN: And we are going to leave it there. That was, of course, Hillary Clinton responding to Bernie Sanders. 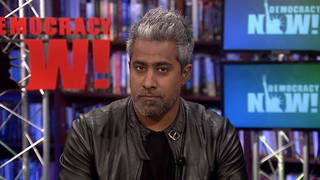 I want to thank our guests: Green Party presidential candidate Jill Stein; Pulitzer Prize-winning journalist Les Payne, who’s writing a book on Malcolm X; D. Watkins, who wrote the book The Beast Side: Living (and Dying) While Black in America; and Zaid Jilani, staff writer at AlterNet.